LOS ANGELES — This weekend the City of Angels is the setting of an escalating struggle with distinct battle lines. In a situation that’s unique to Los Angeles, two NBA teams have been coexisting there for 26 years, and this weekend they will clash as their home city hosts the 60th NBA All-Star weekend. It’s Laker Nation versus the Clipper Clan in the Battle of L.A. 2011. With two teams, neither of which originated in Los Angeles, taking part in hosting the NBA’s most exciting weekend, the question is raised: who really runs this town? On one side there’s the Clipper Clan, led by faithful commander Darrell Bailey aka Clipper Darrell , a 10-year season ticket holder and the team’s most vocal fan. 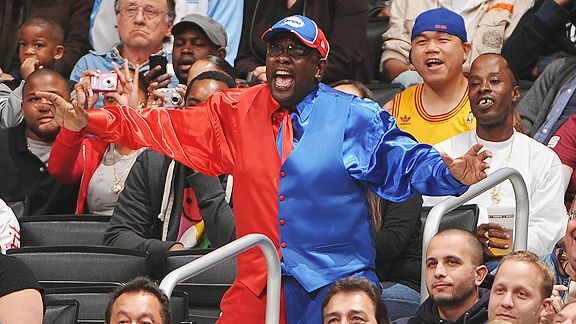 Every night the stout man in red, white and blue leads Clipper faithful in “U-G-L-Y” chants, underscoring the underdog spirit that characterizes Los Angeles’ unglamorous team. Darrell is an L.A. legend representing the average man. After losing his job and being told he would never amount to anything, he put his faith in a team residing at the bottom of the league and became its biggest cheerleader. In good times and bad (mostly bad, for Clippers fans), you can catch him cruising around town in his tricked out red, white and blue 1995 7 series BMW, complete with Clippers interior. With the NBA All-Star weekend in his city he is ready to represent his team every day, all day. Hop on the freeway to Hollywood and you’ll find the ultra-sophisticated Laker Nation, led by Chris Manning, co-creator of TheLakersNation.com, a go-to site for all news and rumors related to the team. With the Lakers’ 17 championships, Manning knows his team has bragging rights and intends to show the world just that during All-Star weekend. Manning created a motto for all Laker fans to live by: “One Nation, under Phil, Kobe’s invincible, with Laker Girls and free tacos for all!” Under this mantra, Laker Nation bleeds purple and gold together. On the other end of the spectrum, Clipper fans are all heart all the time. It takes a special person to follow one of the league’s historically worst franchises. Although Darrell ridiculed Laker fans for being snooty, he will be attending the high-class parties this All-Star weekend, including the hottest party in town thrown by Kenny “The Jet” Smith. Manning will be on the outside looking in for most All-Star parties but, he is secure with the Lakers’ tradition of excellence in this town. As the NBA franchise with the second most championships, all Laker fans know is victory. Laker Nation will continue to bask in its greatness this weekend as it unveils a Jerry West statue Thursday outside of Staples Center, home of the Clippers and Lakers. This is the third statue outside of the arena to commemorate a Laker. No statue exists for the Clippers. This is how Laker Nation marks its territory. Darrell says Clipper fans aren’t fazed. His followers have erected a shrine in their hearts for their new savior, Blake Griffin. As a first-time All-Star, slam dunk contest participant and nightly rim-rocker, Griffin has put the Clippers on every fan’s must-see list. “What’s so exciting to me is when you watch it on TV and people are wearing Clipper jerseys and we are selling out arenas again,” said Darrell. Even the head of the Laker Nation acknowledges the Clippers’ turnaround that Griffin has sparked. While the Lakers clearly have the upper hand in terms of competitive credentials, the Clippers are coming on strong and have even grabbed the heart of the leader of Laker Nation. Griffin may be the olive branch who brings the two sides together in this ongoing conflict. Until then, the Battle of L.A. wages on. Legacy and excellence lie on one side; promise and humility on the other. This NBA All-Star weekend, choose wisely.